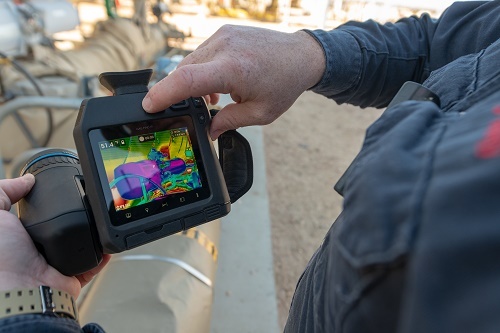 FLIR Systems, Inc. on Thursday, February 7, announced the FLIR GF77 Gas Find IR, its first uncooled thermal camera designed for detecting methane. This handheld camera offers inspection professionals the features they need to find potentially dangerous, invisible methane leaks at natural gas power plants, renewable energy production facilities, industrial plants, and other locations along a natural gas supply chain. The GF77 provides methane gas detection capability at roughly half the price of cooled gas inspection thermal cameras, to empower the oil and gas industry to reduce emissions and ensure a safer work environment. FLIR designed the GF77 to include its most updated technological features, including laser-assisted autofocus to help inspectors target leaks better, and one-touch contrast improvement that makes gases stand out clearly against the background. Additionally, a rapid-response graphical user interface helps professionals increase efficiency by allowing them to organize job folders, record notes, and add GPS location annotation on the camera. The FLIR GF77 is available for purchase today globally from FLIR authorised distributors. To learn more, please visit www.flir.com/GF77.